I’m pleased to announce the IsoSwitch.201802 release of the CrowdSwitch SW and HW source code. This release substantially validates the overall HW design. The code runs at full speed on real hardware (though it still has plenty of bugs and missing features). 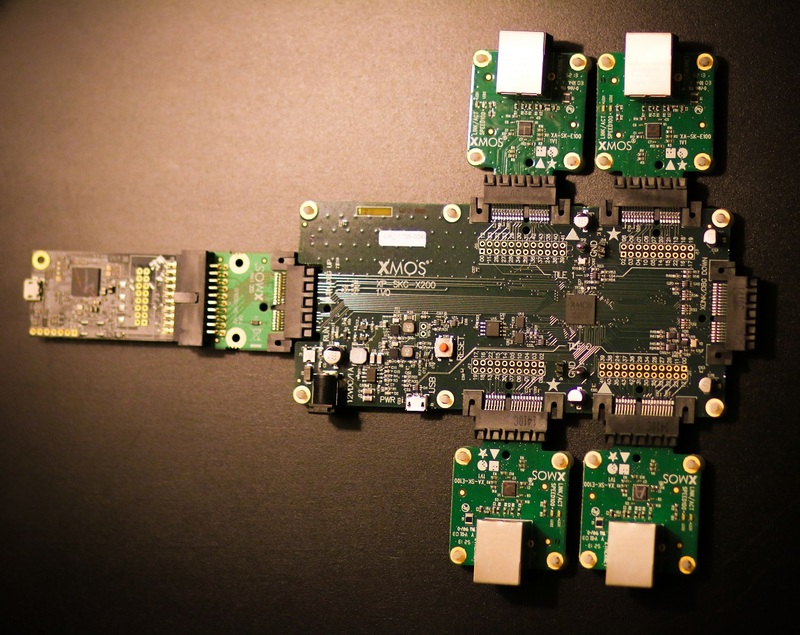 The proof-of-concept hardware is an off-the-shelf $300 XCORE-200 SliceKIT development board with 3x Ethernet | XA-SK-E100 SliceCARDs. In the meantime, I’ll be working on building an Energy Ledger in C# to run on the SoC. This will also allow me to beef up the unit test. I’m happy to announce that the CrowdSwitch‘s hardware design files (i.e. mechanical drawings, schematics, bill of materials, and PCB layout data) are now open source. Much of the design was lifted from the xCORE-200 SliceKit examples. My work is all done in KiCad. If anyone has a chance to review these, I’d be super thankful! It’s all at: https://github.com/IsoGrid/IsoSwitch. 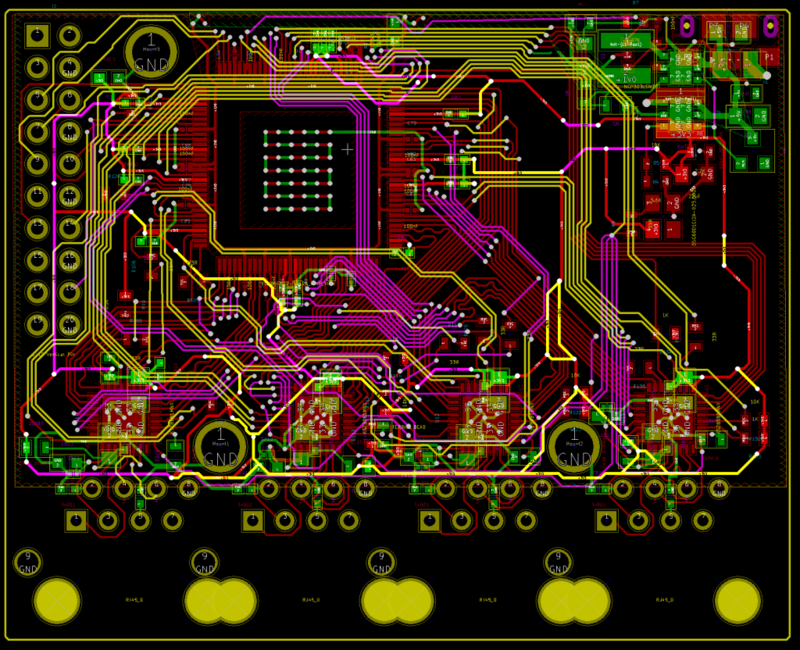 If KiCad isn’t for you, let me know and I’ll try to figure out how to deliver your preferred format. I’m also looking for any advice on how to go about procuring parts and who I should look into for PCB and PCBA. I’m currently thinking of going with Seeed Studio for a batch of 5 prototype fully assembled PCBA and doing the SW bring-up work myself. In the 1990’s, the Internet seemed to be an incredible distributed network capable of transforming the world by making it more open and free. To a great extent, it has done this. But after seeing the good progress we’ve made, we understandably want more of that openness and freedom. Net Neutrality proponents want widely distributed access to a free (as in freedom) and open network. Net Neutrality opponents want ISPs to have the freedom to run their network free from regulations. IsoGrid: A new globally-scalable network protocol with a mesh topology. Instead of being limited to traditional address-routed packets, the protocol uses source routing to set up bounded-latency isochronous streams avoiding the problem of congestive collapse. Once a stream is set up, the route is given a numeric name to support routing micro-packets (µPkt) both directions along the route. To support isochronous streams across the entire network, the framerate of every link is a power of 2 frequency relative to TCG time, this opens the door to many new scenarios that require precise relative timekeeping. Micro-transfers of Energy, which are made ‘by simple agreement’ between each neighbor along a route, are used to cover sending data across the network, avoiding the Tragedy of the Commons. Client endpoints are responsible for building up multi-path redundant link maps through the network, relying on the advertised 3D-Geohash locations of the nodes to track only a subset of nodes within a given area; providing scalability, redundancy, and wider distribution of power. The hash-based locating mechanism gives a convenient solution to distributed data storage. Contrasted with TCP/IP, the new protocol stack’s layering model provides additional options for streams, packets, safety, reliability, robustness, latency, and extensibility. Most importantly, the entire protocol was morally designed with its socioeconomic side-effects as a guide. Removed IsoStreamFooter by decrementing an (integer) IsoStreamWordCount every time a word of the IsoStreamRoute is used up. Added some more detail to Advertisements. This work is published from: United States. This document is still an early draft. If you’d like to help improve it, contact Travis.Martin at this domain. Discussion at Hacker News! Idea about Micro-Payments within a computer to fairly allocate resources; say, in a VM environment. When discussing mesh networking, the common refrain is “mesh networking is not scalable”. Here is data and code that indicates it can scale ‘enough’ to support a full-scale global isochronous mesh network of 2^40 nodes with mostly stable links. These data were generated by running a mesh routing algorithm on each node in simulated networks sized from 2^7 to 2^23. Note that this algorithm isn’t the full spec’d IsoGrid algorithm, just a framework to test scalability. The global network topology is approximated by placing nodes in a 2D grid pattern and linking each node to the 4 nearest nodes (except at the edges and corners). It follows from #1 & #2 that latency per hop can be bounded by a constant. See the IsoGrid Protocol Specification v0.225 for details on why. Specifically, #3 is reasonable at least until 2^47 nodes (~1 node per square meter of the land surface of the earth). Light takes ~5ns to travel 1m in optical fiber. With 128 bit words switched isochronously at an achievable 100Gib/s, each hop in this full-scale scenario has on the order of 1.2ns extra latency. #4 reveals an acceptance that mesh networks with highly mobile nodes (actually nodes with highly transient links) aren’t likely to be scalable. But the switches that form the network don’t have to be mobile, just like the core routers of the Internet aren’t mobile. The current TCP/IP Internet routing table is NOT scalable: Each node must know about all other nodes. #6 means that the following is only likely true but isn’t proven: Isochronous&source-routed mesh networks can scale to 2^40 nodes with conservative assumptions about topology and current technology. If, instead, one assumes a more 3D topology would develop naturally in the full-scale scenario (urban environments, satellites, and rooftop wireless laser hops), then it scales beyond 2^50 nodes. #7 means that taking a simple bisection of the square grid produces the nodes that have the heaviest bootstrapping data load to switch. In order to be a viable network, this load must be a small portion of the available bandwidth of those nodes. Higher physical bandwidth links and more stable links network wide make this better. The simulation code is shared here for verification and reproducibility purposes. This code is NOT production quality. It’s never been code reviewed. It’s more important to move to the next phase of development rather than spend time cleaning up the simulation code. *The 2^21 sim required a large system and many hours of compute time, so it was only run 7 times. The 2^23 sim required a very large system and two days of compute time, so it was only run once. If one normalizes the per-node cost (the number of hops traversed per node) by distance, then the per-node cost growth rate upon doubling the network size is low (<6%). This can be done by assuming the growing number of nodes are spread evenly over a non-growing space: Since the network is a square, this normalized growth rate was computed by multiplying by the square root of the network size. The last point seems like a lot of data for a simple bootstrap, but this would be 5-10 years in the future where 10Gb/s links would be the bare minimum, and this data can be transmitted in about a minute. Even if these extrapolations are low by a factor of 100, with the assumptions made above, the network would still perform well. In June, I implemented (in C#) the first draft of a scalable and efficient multi-path route-finding algorithm to use on a simulated IsoGrid. The result of this work led me to make some improvements to the IsoGrid spec. My next step is to share out this IsoGrid simulation (along with the produced data) to prove to myself and others that a mesh protocol can actually be globally-scalable. This post is excerpted from the IsoGrid Protocol Specification v0.220. If you’d like to skip ahead, check out the spec! These are the requirements I started with before designing the IsoGrid. Differential GPS everywhere, even indoors? Discussion is at Hacker News! It should be immediately clear to the reader that communication protocols, like TCP/IP, have dramatically changed the world. What is less clear, however, is that the specifics of protocol design can have wide-ranging social and economic effects, some positive, some negative. Many networks have a design that reinforces economies of scale. One can see this clearly with the train railroad network: The bigger, more interconnected systems beat out the smaller, less interconnected systems. This also creates huge barriers for new entrants, making it practically impossible for them to compete against the established providers. We submit that economies of scale with the present Internet are creating fewer and fewer providers, and concentrating control in a few individuals in the same way that the rail system of the late 1800s did. This doesn’t have to be the case though. The grid topology of our roadways doesn’t seem to have these same effects. The barrier-to-entry for personal use of the roadways is much smaller compared to that of the railway providers. How small can we make the barriers to entry in the telecommunications market? Where are the Roadway Tycoons? In the same way, the IsoGrid is designed to be less effective than the Internet at centralizing wealth and power. The “Iso” in IsoGrid is short for Isochronous, meaning ‘same time’. Isochronous means that bits are sent (and then arrive) at a specific well-defined frequency. A theoretical isochronous stream running at a frequency of 1 MHz would transmit one word of data every millionth of a second. Implementations of Isochronous protocols can operate with statically sized buffers, and bounded latency guarantees. VoIP, Internet video, and Internet radio are best sent over an Isochronous connection. Over 50% of peak Internet traffic is actually perfectly suited to Isochronous streams. The early POTS telephone network operated with an analog audio stream, and so early digital communications protocols that evolved from this network could be considered Isochronous. However, over time, the world has instead settled on a packetized asynchronous solution, which is now called the Internet. Being based on packets, the Internet has terrible support for isochronous connections. This is why your YouTube movies always need to ‘buffer’ before playing: It’s sending a few seconds (or more) of the video to the recipient before it starts playing so that it can compensate for the randomly-timed delivery of packets. If the net had support for true isochronous connections, then it would be possible to watch YouTube and Netflix videos without having to wait for the ‘buffering’ to complete. At its core, IP allows a maximum of 255 hops for any packet. This inherently restricts the topology of the Internet: As it stands, it can never be a world-wide mesh. Instead, you end up with large hubs and choke-points. So far, all attempts to create interop standards for nodes that can hop between networks have been unsuccessful. The IP addressing scheme also makes it very difficult to have a mesh: IP addresses are assigned hierarchically. The name “Inter-Net” describes the problem directly: The Internet isn’t a global network that just anyone can contribute or connect to; instead, the Internet is just a protocol for inter-connecting the world’s centrally owned and operated networks.